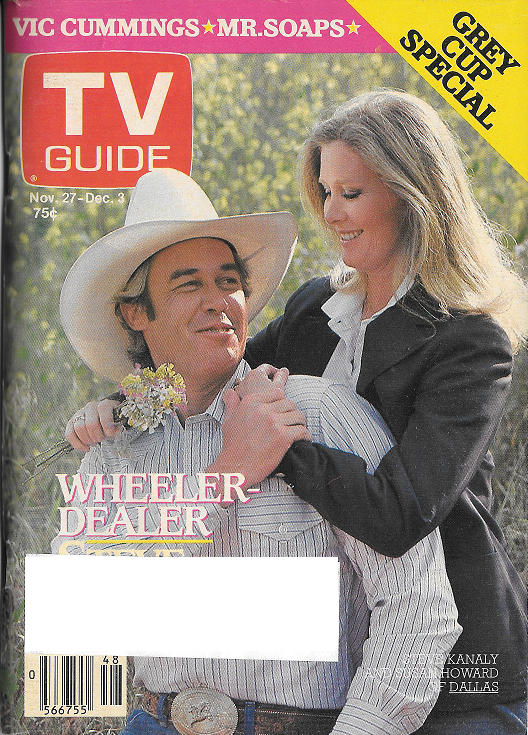 This week we have something a little different to offer: the Canadian version of TV Guide. It may look similar to what we're used to seeing here (other than not having Meredith Baxter Birney on the cover this week as does the United States edition), but in reality they're two different publications. As the always-reliable Wikipedia notes, the Canadian version was actually split off from the U.S edition in 1977 when the Canadian rights were acquired by Telemedia. Eventually, the Canadian version would have a completely different editorial conent, predominently Canadian but including features on American programs that didn't appear in the U.S. version. This is true; the layout, the article layouts and fonts, are completely different from anything we've seen in TV Guide during the '80s. 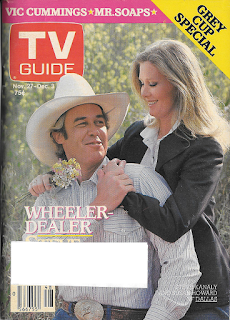 One note that I enjoyed reading was that "while the U.S. TV Guide began reducing its television listings in favor of incorporating more editorial content, until the 2000s, the bulk of the Canadian magazine's content remained the localized listings." Which is as it should be. Even with that, I would have been likely to give this issue a pass were it not for this week's feature presentation - one with a definite Canadian angle. The legendary football coach Bud Grant, who took the Minnesota Vikings to four Super Bowls in the 1970s, once described the Super Bowl as the American version of the Grey Cup. When the first Super Bowl was played in 1967, the Grey Cup had already seen 54 editions. The championship game of Canadian football was first played in 1909. (The NFL, by contrast, wasn't even formed until 1920). Originally, both professional and amateur teams were eligible to play for the Cup, but by the 1950s the Cup had come into exclusive possession of the newly formed Canadian Football League, an amalgimation of the country's two major professional leagues. 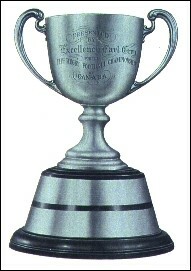 Over the years, the Grey Cup has seen a series of extraordinary games, including the 1954 game, in which Montreal, leading late in the game, fumbled a pitchout (according to some, the result of a risky play designed to make sure the Alouettes would cover the point spread) that was returned 90 yards by Edmonton for the winning touchdown; the 1962 "Fog Bowl," won by Winnipeg 28-27 over Hamilton in a game that took two days to play due to a heavy fog that literally made the field impossible to see; and last year's game, which saw hapless Ottawa, with a regular season record of 5-11, nearly pull off the greatest upset in the history of the Grey Cup, leading 14-1-1 Edmonton (winner of the three previous Grey Cups) at halftime 20-1 before seeing the Eskimos rally to win with a last-second field goal, 26-23. In the 1982 contest, the Esks are back and looking for a reccord fifth straight win, this time against the Eastern champion Toronto Argonauts from Toronto, broadcast live on both CBC and CTV. The coverage actually begins at noon on Saturday, with the Grey Cup Parade through the streets of Toronto - the theme is "The Magic of Canada." CTV presents a replay of the 1981 game, while CBC has a three-hour review of the 1982 season, along with coverage of the awards banquet held on Thursday night. Sunday, CBC looks a the history of the Grey Cup at 10:30 a.m., while CTV shows highlights of the Miss Grey Cup Pageant and other events of the festival week. Finally, at noon, it's to CNE Stadium and the game itself (French-language coverage is via SRC). TV Guide's special Grey Cup section includes Bruce Dowbiggin with ten ways to improve the CFL (several of which have since been implemented), Richard Hidei on the rich heritage of Canadian-born players in the Big Game, Eric Nicol and Dave More on what it takes to be a succes in professional football, and recipies galore for your Grey Cup parties - avocado stuffed with crabmeat and lime mayonnaise, candy apple fritters, raspberry bombe). In the game itself, played in a steady rain, Edmonton does indeed win its fifth straight Grey Cup, defeating Toronto 32-16. I saw my first Canadian football game sometime in the 1960s; there was a weekly game shown on WTCN, Channel 11 in the Twin Cities. I was already a football fan, and there was something about the Canadian version that immediately captured my interest. The field was longer (110 yards) with 12 players to a side and only three downs, and the teams had exotic-sounding names like the Argonauts, Tiger-Cats, Blue Bombers, Rough Riders, and Roughriders. (Long story; I'll explain it to you sometime.) It hasn't always been easy to keep track of Canadian football; in addition to the syndicated game on Channel 11, Wide World of Sports showed the Grey Cup for a few years, and NBC picked up some of the games during one of the NFL strikes, but until the advent of cable TV and the internet, it could be a real challenge. ESPN covered the game during the network's early years, and returned in the last few years to provided weekly coverage on TV and online. ESPN2 will be carying the 105th edition of the Grey Cup tomorrow evening (5:00 p.m. CT) from Ottawa; Toronto is back for the first time in five years, this time taking on the Calgary Stampeders. Calgary enters the game a heavy favorite, but as we've seen over the years, the Grey Cup is played on the field, not on paper. It's been years since I've watched the NFL, but I've remained a fan of the CFL - a quicker game, a quirkier game, and frankly a more entertaining game. We'll see how it turns out on Sunday, but in the meantime, go Argos! You might ask yourself what the content difference is between CBC and CTV, on the one hand, and, say, CBS and NBC on the other. We'll see that in more depth on Monday, but the short answer is: not much. Although federal law requires a certain percentage of Canadian content on Canadian television (a running joke on SCTV; the "Great White North" feature was mockingly designed to satisfy the CanCon requirement), prime time television in Canada can look a lot like it does south of the border. For example, a typical night might include series such as Remington Steele, Knots Landing, The Facts of Life, Real People, The Fall Guy, Dynasty, M*A*S*H, Newhart, and Simon & Simon. On the other hand, there's also the CBC series Seeing Things and Hangin' In, the long-running nature program The Nature of Things, and the Lassie-like The Littlest Hobo. It's also interesting to find out the kinds of things that are part of Canadian culture, such as a documentary tribute to champion skiier Steve Podborski, a celebration of the 25th anniversary of the Canada Council, The Tommy Hunter Show, a country-variety show which ran on CBC for over a quarter-century, and, of course, The Alan Thicke Show. The National, the CBC's 10 p.m. news program, runs under the guidance of chief correspondent Knowlton Nash. 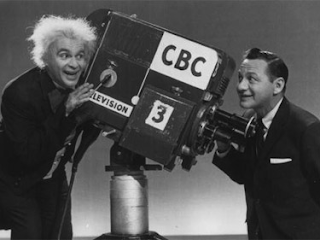 Vic Cummings is another integral part of Canadian television. As the daytime announcer and host of his own talk show on Hamilton's CHCH, Cummings acts more like the impresario of a matinee movie, and in his own way he's become as famous as the soap opera stars whose activities he updates on his daily half-hour show, Soap Box. As Shelly Davis points out in her article, Cummings is expected to know everything about every soap on the air, and his live interactions with fans during his program have made him so well-known that he now emcees mall appearances by soap opera stars throughout the area. Now, it's true that most of the soaps that Vic Cummings waxes on, like most of the prime-time programming on Canada's various stations, come from America. Even today, watching the commercials for CTV that run on subsidiary TSN's coverage of Canadian football, most of the programs advertised are ours. But there are exceptions, as there always have been and always will, and that's as it should be. One of the things I dislike most about today's television is the homogenization of it all, how there are seldom any regional differences anymore, how every local news program sounds like every other local news program, how onetime niche cable networks now look so identical, sharing so much programming, that one has to ask what point there is in them even existing. It may well also be the case in Canada, but as long as Canadian television doesn't become a carbon copy of the United States, there's still hope. 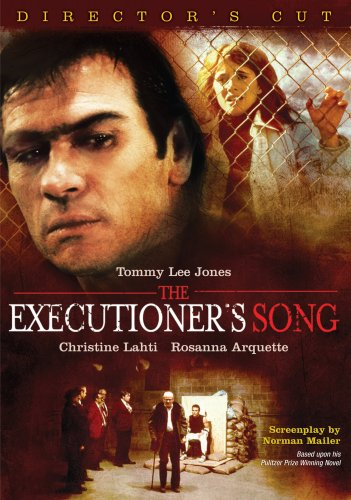 To understand the power and the appeal of Norman Mailer's "non-fiction novel" The Executioner's Song, a four-hour TV-movie aired on NBC November 28 and 29, it's necessary to understand the story of Gary Gilmore, the murderer executed in Utah in 1977, whose life - and, particularly, death - is the basis of the story. The Supreme Court had supposedly declared the death penalty unconstitutional in 1972 in the case of Furman v Georgia; in fact, the Supremes merely found that death penalty laws as they were presently constituted were cruel and unusual; in Gregg v Georgia in 1976, the Court upheld a new series of laws, and the death penalty was back. Gilmore, who refused any attempts by the ACLU or any other organization to prevent his execution, was the first prisoner in the United States to be executed in nearly ten years, and the drama of the legal battle catapulted Gilmore to international attention. In this issue, William F. Buckley Jr., who was what we would now think of as a "frienemy" of Mailer's and at whose house Mailier was a guest during the writing of The Executioner's Song, looks at the movie - at the whole story of Gilmore, in fact - and meditates on the value of both. Gilmore, unlike, say, Dillinger or Bonnie and Clyde, was not an interesting person; his life, says Buckley, was "fearfully dull." Nor was he a compelling personality - "He is rude, ungrateful, stubborn, boisterous, sullen, cruel." No, the interest that Gilmore creates is one of a social kind. "We will learn about these people," writes Buckley, "and it is always instructive to know sometihng about hyuman confusion." Gilmore's quest to be executed for his crime carries its own fascination." Even the end of his life, which came at the hands of a firing squad, is devoid of any tragic overtone. "The grief evoked by his execution is strictly of the catechism variety. We must grieve any man's violent death, the Good Book tells us, because, after all, Jesus forgave his own executioners. That reminds us of what is already overwhelmingly redundant - namely, that we are not Jesus." Ultimately, Buckley pronounces the movie version of The Executioner's Song to be a failure. No matter how brilliant the screenwriter and director, "they cannot rescue what is adamantly boring, becuase, although words can transfigure, the screen cannot. As a screenwriter, Mailer cannot accomplish those miracles he can accomplish as a prose writer." In this sense, I suppose Buckley is speaking, as did Hannah Arendt during the trial of Adolf Eichmann, of "the banality of evil." Gilmore's evil, like his life, is unremarkable; it will be "an eternity before anyone devotes four hours to dramatizing the life and death of someone the forgetting of whom is altogether therapeutic, even as we tend to forget pain." The decomposition of the mind, says Buckley, is of interest to professionals, in schools. "For nonprofessionals, it wasn't fun even then. We don't stand to get any credits for sitting through this one." What else do we have this week? Saturday night is Hockey Night in Canada, a CBC staple, and tonight at 7:00 p.m. the original incarnation of the Winnipeg Jets* take on the Maple Leafs in Toronto. At 9:30 p.m., the cable service Teletheatre (available in Regina and Moose Jaw) presents the truly adult murder mystery True Confessions, with a strong cast including Robert De Niro, Robert Duvall, Charles Durning, and Ed Flanders. And while NBC may have Saturday Night Live, CBC has Ed Sullivan's old favorites Wayne and Shuster (left). Tonight, in a tribute to the Grey Cup, "Coach Saul King (Shuster) pits his Jericho Jets against the Philistines in the 1975 B.C. Matzoh Bowl. Starters include David and Goliath." *Not to be confused with the new Winnipeg Jets, who used to be the Atlanta Thrashers. The original Winnipeg Jets are now the Arizona Coyotes. As I said earlier, it's a long story. Besides the Grey Cup, Sunday brings Country Canada (CBC, 4:00 p.m.), including a look at the annual wheat harvest, which runs from Texas to Saskatchewan. At 6:00 p.m., CBC has Walt Disney's World, with Professor Ludwig von Drake. Later, at 7:30 p.m., the same network has Super Show, featiuring a reunion between Pete Seeger and the original Weavers. And at 9:00 p.m., it's the Canadian WWII drama Home Fires; next week in the same timeslot, it's part one of a three-part miniseries based on Laura Beatrice Burton's memoir I Married the Klondike. I suspect that's a series that you'd only see in Canada. Monday features a host of popular American comedies on CBC: Happy Days, Private Benjamin, M*A*S*H, Newhart, while CTV counters with That's Incredible! and the Valerie Harper-Dennis Weaver thriller Don't Go to Sleep. Meanwhile, on Tuesday at 10:30 p.m., KSRE, the PBS station in Minot, North Dakota (about a four-hour drive from Regina, home of the Saskatchewan Roughriders) has PBS Latenight; the topic under discussion is X-rated videos. I so wanted to find out that the host of Latenight is Charlie Rose; alas, it's Dennis Wholey instead. You can tell Christmas is just around the corner - on Wednesday the North Dakota stations feature Rudolph the Red-Nosed Reindeer (CBS, 7:00 p.m.) and the rarely-seen Ziggy's Gift (7:30 p.m., ABC). At 10:00 p.m., CFQC in Saskatoon has To Light a Candle, the story of Canadian missionary Mark Buntain, who worked with Mother Teresa in Calcutta. And on CJFB in Swift Current, Merv Griffin's guests are the opera greats Beverly Sills and Sherrill Milnes, and New York Times columnist Russell Baker. I mentioned soap operas earlier, and Thursday gives me a chance to point out that CBC carries the legendary British soap Coronation Street (2:30 p.m.), which came to Canada in 1966, six years after its premiere on ITV. In 1982, the episodes were being aired approximately 10 months after their initial broadcast in the UK. And Friday wraps up the week with Falcon Crest on CTV and Dallas on CBC, both at 9:00 p.m. (Dallas features a great story - the wedding of J.R. and Sue Ellen. I wonder how many times the two had married each other at that point?) Finally, would you be surprised to learn that at 11:30 p.m. CBC has SCTV Network? One of the highlights is a seasonal feature: Neil Simon's "The Nutcracker Suite." Well, it's been a most interesting experience, this journey through a foreign edition of TV Guide. Hopefully, between some of the programs I highlighted, the listings above, and the listings to come on Monday, you'll have a flavor for Canadian television in the early '80s. So what do you say we end the week with a recipe for Quiche de la Coupe Grey - you can enjoy it during tomorrow's game! Bake shell in a 450⁰F [or 232⁰C] oven 7 minutes, or until golden. Remove shell and lower heat to 325⁰F. Cook bacon until crisp. Drain, crumble and set aside. Combine eggs, milk, flour, salt and nutmeg, mix well. Fold in bacon, cheese and mushrooms. Bake in 325⁰F oven 35 to 40 minutes, or until middle sets and a tester comes out clean. Serve with grilled sausages and back bacon. Serves 6. Lots of Wayne and Shuster sketches from the 1970's (though their prime years were in the 1950's and 1960's, the color sketches from their 70s and 80s specials are more accessible) are available on YouTube. 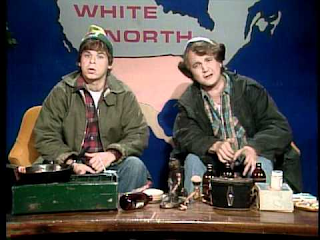 I always enjoyed them, though some of the humor is more specific to Canada. (i.e. their James Bond-ish secret agent is a parody or Mr. Nash's name: Knowlton Nebbish) When they were on, they were really funny. The series didn't end until Wayne's death in 1990. Go on YouTube for CFL things---there's a treasure trove!!!!! ...and let's not forget the Canadian drama, Seaway with Stephen Young, a Canadian actor who went on to play Clinton Judd's young legal protege, in Judd for the Defense on ABC. CBC's "Nature of Things" continues to push the envelope of scientific & social norms on this thought-provoking series hosted by noted Canadian scientist & activist Dr David Suzuki. In fact, I plan to watch this week's episode Sunday evening!! 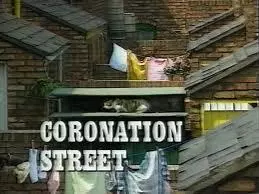 Also still carried on CBC is British soap "Coronation Street"
As always Mitchell, I'm looking forward to the day's TV Guide listings & may have more to reveal once I examine the listings. Thanks for finally featuring a Canadian edition! My first exposure to the CFL was when KOLN in Lincoln started carrying the games. 1972 Heisman Trophy winner Johnny Rodgers spurned the San Diego Chargers and played his first three seasons as a Montreal Alouette. Bud Grant is only one of two people in both the Pro Football Hall of Fame and the Canadian Football Hall of Fame. Warren Moon is the other. Bud is in there as player and coach of the Winnipeg Blue Bombers. The Grey Cup game was tonight in snowy Ottawa, and the Toronto Argonauts are your 2017 CFL champions. The Calgary Stampeders had a chance, but quarterback Bo Levi Mitchell pulled a Brian Sipe and threw a pick in the end zone. And what a wonderful game it was - the fumble return was pure "Argo Bounce," wasn't it? Shades of 1954!